Oil has dropped considerably, losing 50% of its price since hitting $100 a year ago. A global economic crisis is setting in and consumers are cutting back on their auto buying in a dramatic way. This change has dramatically impacted hybrid sales. Yes, hybrids - the darlings of the automotive industry as consumers were supposed to move to green vehicles in a major way after seeing $4 plus gas prices in 2008. Well guess what? Gas prices fell more than half in late 2008 and hybrid sales followed with a 53% drop in sales from a year earlier, compared to a 37% drop in car sales overall. Go figure, someone isn't as willing to pay a $3,000 - $5,000 markup for adding an electric engine to a gasoline powered car when their wealth is falling and their job stability is in doubt. All of this change should shift how hybrid cars are marketed. You have to wonder first if the hybrid message is losing its cache with the newer innovative technologies like Electric Vehicle (EV) cars coming in 2010 that will certainly be the focus, desire of the green consumers. 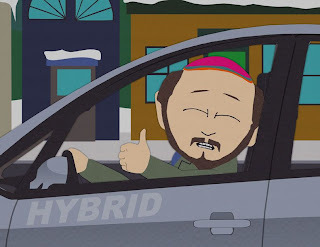 I also question if hybrids will simply lose sales because its consumers are those in the lower $100k household income range that are being impacted considerably by the loss of value in their McMansions and stock portfolios and are already cutting back considerably on luxury labels like Coach, Williams-Sonoma, and Juicy Couture. Hybrids have come to be more of a status symbol than a true revolution in automotive design. Don't get me wrong, they are a step in the right direction, just not a major shift since they still require gasoline engines to function. The marketing shift should focus beyond just green-minded consumers. I think Toyota has done well with their Lexus Power of h campaign, but it is solely tailored to a green consumer and does not extend beyond them. Certainly, green consumers are already aware of the hybrids and it is now more about reaching to the customer who isn't buying green products and showing them that hybrids aren't all flowers, blue skies and green valleys. It's about making hybrid a more intelligent choice (e.g. innovative technology, proven efficiencies) and showing hybrid isn't something that is just for wimps or smug greens. It will be interesting to see how hybrid marketing evolves in the coming years, especially as hybrids start spanning different vehicle segments. Cadillac is definitely struggling with its Escalade Hybrid, but that doesn't surprise anyone. The good news is that cars like the Tesla Roadster (full electric) and the new Ford Fusion Hybrid aren't tin can econoboxes or vanilla looking sedans. Some style is finally coming into the green vehicle segment.